Getting the best rate hua hin hotel is one of most important parts when you are looking to book your vacation. 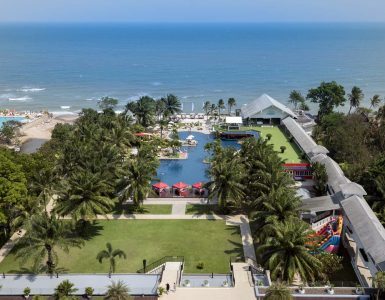 Whether you are travelling from abroad or as close as Bangkok, Novotel Hua Hin Cha Am Beach Resort & Spa offers great prices on all of their rooms. The location is very convenient, just two hours from Bangkok. Novotel Hua Hin Cha Am Beach Resort & Spa is located between Cha-am beach and Hua Hin beach. You will enjoy the seaside and natural garden that will help you relax and clear your mind. Our hotel has a choice of five room types, all of them include a private balcony with a beautiful view of the Gulf of Thailand. This feature is most definitely one of the highlights at the hotel. This best rate Hua Hin hotel also boasts a large outdoor swimming pool complete with a waterslide. Enjoy every minute with your friends and family during your stay here. Our Horizon Cafe and Ocean Terrace restaurant serves delicious food for international and local cuisines and drinks with reasonable prices. The picturesque Gravity Sky Bar is the highest bar in Hua Hin and Cha-am where you can enjoy the beautiful city and ocean views. This best rate Hua Hin hotel currently has a special promotion with prices starting from 2300 ++ baht. Rest assured that your children are in very good hands. Novotel was recently awarded the ‘Best Family Hotel in Hua Hin’ by Trip Advisor. Take a look at our Kid’s World center complete with a ball house, game zone, toys and a lot of other activities going on. Because children are one of our most important guests, if under 16, they can share the bed with parents without any charge and enjoy a free breakfast at the Horizon Cafe if parents are having breakfast with us.